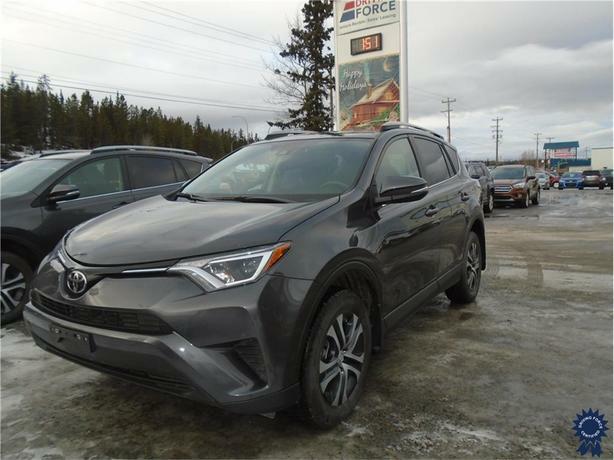 This 2017 Toyota RAV4 LE 5 Passenger All Wheel Drive SUV comes with 6-speeed automatic Super ECT transmission with sequential shift mode, gate type shifter, and transmission cooler, electronic transfer case, 4.071 axle ratio, magnetic metallic gray exterior color, permanent locking hubs, roof rack rails, splash guards, AM/FM/CD/MP3/WMA 6.1-inch Display Screen with shark fin antenna, voice recognition, audio auxiliary input jack, USB audio input, Bluetooth capability, 6-speakers, phonebook and streaming audio via Bluetooth, SIRI Eyes-Free Wireless Streaming, manual tilt/telescoping steering column, cruise control with steering wheel controls, manual air-conditioning, two 12V DC power outlets, lane keeping assist, backup camera, and GWVR rating of 4,640 lbs (2,105 kgs). The 2.5-litre 4-cylinder gas engine provides 176 horsepower at 6,000 RPM and 172 lb-ft of torque at 4,100 RPM. Touch base with us to discuss purchasing or financing options that are right for you and experience the difference you will only find at DRIVING FORCE Vehicle Rentals, Sales and Leasing.